Smith, of course, has a resolutely populist approach, since every film he made after “Clerks” was technically done for a studio. Nevertheless, the tidbits of films from the IFP’s Independent Filmmaker Labs, which screened outdoors last night at the pier on 23 Street and East River, formed a series of attempts to create commercial appearances – at least to the point where industry folks might decide to open their wallets. On the narrative side, several of the features previewed in brief trailers and clips appeared to seamlessly move from their treatments to the screen. Anthony Stephenson‘s “Good Intentions,” a black comedy about a southern woman whose desire to get rich leads to acts of robbery, was presented in a sleekly-designed trailer, complete with an omniscient voiceover from the Don LaFontaine playbook (“a less-than-perfect childhood…”). A series of clips from Patrick Epino‘s “Mr. Sadman,” the story of a former Sadaam Hussein impersonator trying to find work in 1990 Los Angeles, played up the comedic potential of the story and hinted at its solemn undertones. The documentaries from the lab were also nicely packaged to showcase their commercial viability. Chief among them, “The Hand of Fatimah” follows documentarian Augusta Palmer‘s attempt to understand the legacy of her late father, rock critic Robert Palmer, whose obsession with a 1,000 year old band in Morocco forms the centerpiece of this clearly beautiful, sharply provocative meditation on the significance of hippy enlightenment. Troy Word‘s “The Presence of Joseph Chaiken” put last night’s audience in a contemplative mood, since the movie surveys the highly experimental theater work of the New York artist, with input from Sam Shepherd, F. Murray Abrahamson and others. Lee Storey‘s “Smile ‘Til It Hurts” got one of the strongest receptions, with its naturally amusing look at the goofy sixties “Up With People” group, which combined cheerful singing with social activism. Back on the narrative side, even the blatantly dramatic works were assembled as crowd-pleasers. Gerry Ballasta‘s “The Mountain Thief,” set amid the ongoing insurgency in the Phillipines as a father and son flee the surrounding chaos, intentionally highlighted chase sequences and other intense moments. The audience roared in approval. Another topical entry was Joseph Cashiola‘s “A Thing As Big as the Ocean,” a nuanced romance about two lovers (one of whom is a Katrina refugee) wandering around the desert. The minimalist approach to love and social issues recalls Barry Jenkin‘s “Medicine for Melancholy,” an upcoming release from IFC Films that opened Independent Film Week on Monday. Appropriately enough, “Ocean” landed the Independent Filmmaker Lab Finishing Grant, a $50,000 cash prize courtesy of an anonymous donation, at the Independent Filmmaker Awards ceremony today. The Adrienne Shelly Director’s Grant, a $10,000 cash prize established to recognize female directors, went to Dia Sokol‘s “Sorry, Thanks,” another popular lab participant. 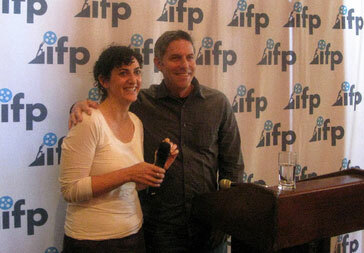 Additionally, IFP awarded the $10,000 Fledgling Fund Award for Socially Conscious Documentaries to Beth Murphy for “The Promise of Freedom,” a documentary included in IFP’s Project Forum. “Not much to say,” Smith said awkwardly, then set the agenda: “Let’s talk about independent film.” And so they did.